Globetrotter Mandy Sham, better known on Instagram as @peach.punk, will likely give you travel envy with her photos of Dubrovnik’s turquoise waters and Tirana’s pastel coloured architecture. Originally from Toronto, Canada, she’s travelled widely across India, Southeast Asia and Europe, but its her warm and charming photos of the New East that grabbed our attention. 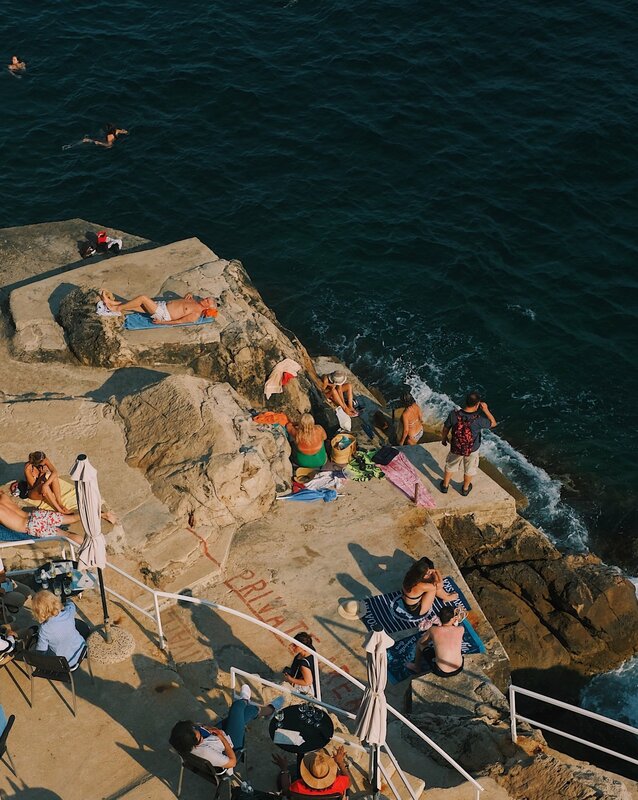 Here, she shares her love of the Balkans, the drawbacks to Instagram-worthy photos and how she’s able to balance photography with a full-time job. I was born and raised in a suburb east of Toronto, which is to say I lived out my childhood in a two-kilometre radius of South Asian eateries and little else. It’s charming in and of itself, but my earliest and fondest memories come from the three years I spent as a kid in Hong Kong — a place I can only describe as the polar opposite of everything since, and a city that’s grown to become a recurring theme in my life. Since I was young, I’ve pursued the arts in some shape or form. I have a BA in Media Production and held a keen interest in cinematography all throughout school. Photography came a little later in my life — I never considered it until I went away to Hong Kong during a university summer. My dad (once a photography hobbyist in his own right) bought me a Nikon J1, a rugged mirrorless for rookies, and I decided to teach myself over the three-month period that I was there. Most of my skillset developed through gradual experimentation and, thanks to travelling, lots of different canvases. It’s safe to say you avoid famous places and landmarks when you photograph. What does travel photography mean to you? I think the way we box ourselves into a certain travel ethos applies to how we creatively document those experiences. It’s important to have a willingness to build genuine relationships with places, and to me that means visiting underrated neighbourhoods and landmarks alike. I’m partial to the idea that what and who you seek out informs how you shoot, at least on a subconscious level. That being said, I’ve always been drawn to shapes and colours in my work. I find novelty in neighbourhoods that feel and look dynamic, local architecture and design, and people either en masse or singled out in a striking manner. I love incorporating light and shadow that are suggestive of time and its passing. Famous buildings don’t typically inspire me on a visual level because I think they lack discovery in the broad, overarching sense. The fun is in capturing something subtler that expresses your own evolving relationship with a place. It’s where you can exercise photography as an empathetic art form. How do you find photogenic places? How important is this? Usually by accident! I’m often wandering around by foot when I travel. In most European cities, particularly in the Balkans, cities are small and compact. They’re often divided into very distinct neighbourhoods — a tourist-dense old town, a revitalised bohemian quarter, a bustling market area, residential outskirts. It’s exhilarating connecting yourself to the dots and creatively documenting the similarities and contrasts. Finding photogenic places is an important aspect of my travel, but with the exception of architecture I seldomly plan ahead. Eastern Europe is often portrayed as harsh, cold, brutal — yet your photos are light and bright in comparison. What do you think of this stereotype based on your own travel experiences? There’s always this exciting element of malleability in countries that grapple with their old and new identities, which is why I think eastern Europe is so interesting. It’s stuck in a rift dividing past and present worlds, and a lot of subversive art and culture tends to come out of that. Add a tumultuous history mired in ethnic and religious conflict, and you end up with a very complicated psyche embedded throughout the region — conditions that, along with the rise of internet culture, have made for an incredibly transformative expression. The idea of eastern Europe as a region devoid of warmth and colour also suggests stagnancy — places that are somehow frozen in time. Nothing could be further from the truth; you’d be hard-pressed to find a place as dynamic as this one. I gravitate toward what you’ve described as “light and bright” in my work, but they’re elements I’ve found to be ubiquitous throughout the Balkans. It’s in the great amount of care that goes to design in boutiques and cafes — Belgrade is a shining example of that — or in the case of places like Tirana and Sarajevo, communist blocks re-painted in bold patterns. Even the mom-and-pops are injected with an undying charm, albeit one that’s a little rough (and a little kitschy) around the edges. What is one country that has surprised you? I arrived in Albania via the Durrës-Kukës highway leading out of Kosovo, which was an absolute vision — mountains looming like a mirage, viaducts glossing over endless green and blue. It’s a precursor to the capital, Tirana, which left a lasting impression that I never quite anticipated. Buildings are painted in an assortment of patterns and colour combinations, effortlessly modern cafés and outdoor spaces are everywhere, and counter to the notion that eastern Europeans adopt a cold and aloof exterior — something I’ve found to be generally true in many places — the case in Tirana is different, with people being extraordinarily friendly and hospitable from the moment you first meet. There’s also an amazing aura of conviviality regardless of the time of day. How has your aesthetic changed since you first started? What have you learned in the process? We all start out voiceless in our craft, but that’s why I love photography — the pathways of endless experimentation, its dependence on instinct and timing, the balance of passive and active participation in a scene. I began with an affinity for pastel colours (one that arguably felt overblown) and a working intuition of basic composition guidelines. Back when I had my first camera, Hong Kong and Japan set a great landscape to experiment in, but everything I documented lacked focus and intention. I held onto certain preconceptions I had about photography — landscape photos made sense for landscapes, the less adulteration in post the better. Editing meant a small bump in saturation and contrast. There’s no doubt that photography is an ongoing process, but I’ve since learned a couple of things — one being that you continue to hone your craft in the absence of a camera. I have such admiration for photographers who carry their equipment everywhere, but my working style is better suited to keeping a little distance from the machine. In some ways it feels like a reset. Another one is that I’ve stopped sharing what I’ll call bare minimum pretty, but continue to document it as a means of deconstruction. To that end, I’ve come to love the benefits of digital photography — you’re kind of going through this phenomenon of self-correcting, where each shot is calibrated ever so slightly until you get the one you want. It requires fewer attempts overtime, and composition becomes more of an instinct rather than a conscious step. How has Instagram affected the way you shoot? When Instagram first made it possible for images to retain their aspect ratio, I started taking an increasing number of portrait-oriented photos. That actually led to an unintentional breakthrough for me. I came to photography with a field production background, where I worked almost exclusively in 16:9 or Cinemascope — it essentially meant I had to relearn and think actively on how vertical images could be composed. Instagram also taught me to straighten my lines (I admit that sometimes I still don’t) and consider negative space. There are definitely drawbacks, too. Several times in the past, I’ve caught myself wrapped up in a really good shot, and the first line of thought would be about how it’d be a great photo for Instagram. That always has the potential to be creatively damaging, but the thought itself isn’t necessarily a negative thing. Maybe it’s a way of reassessment. I do feel a bit apprehensive sharing work that feels “off-brand” and doesn’t play nice, but it’s important to me that I share it anyway. There’s a general disenchantment that surrounds social media these days, but I’ve always seen Instagram as something with the potential to be incredibly meaningful. One photograph of an apartment block in Tirana garnered over 2,700 likes. Is it important to you to understand why one photo gets more likes with another? That apartment building in Tirana looked striking immediately — it had this magnetism about it that drew me in completely. I never thought it would garner as much attention as it did. Analytics are a small mystery to me, but I suppose people have biases and algorithms do too. What the data would suggest is that I should always post shots of pink and blue architecture — beaches are a good consolation prize. Analytics are a double-edged sword in that sense. They illuminate the tension between checking all the boxes and veering off into your own experimental sandbox. I ultimately don’t think the science behind likes and engagement necessarily makes me a better photographer, and I’d be happy to leave it at that. One of the things I enjoy about your account are your lengthy and detailed captions, something other photographers often avoid — what draws you to write them? Travel for travel’s sake is a beautiful endeavour, but it’s also extraordinarily difficult to unpack. All the layers of history and culture and varying perspectives are difficult to digest, let alone explain, let alone depict. I write because, first and foremost, I’m a storyteller. And I write because it’s like I’m unspooling my brain — taking apart the pieces and reorganising them so that the chaos at least makes sense. Pairing my photos with those lengthy captions is how I’d like to go about illustrating a fuller picture. There’s value to be had in casual, inconsistent, emotionally honest journaling. You also work in radio — how do you fit in travel and photography alongside a full-time job? I’m in the fortunate position of working for a company that allows me to take extended periods of absence, which I use to travel several times a year. I spend two-thirds of a year working and about one-third getting stuck on a highway in Nepal somewhere, which is a good balance for me. I guess the rest is mixing curiosity with fiscal responsibility. Though I do like to occasionally take on freelance work and collaborations while I’m abroad, it’s usually a spur-of-the-moment thing arranged while I’m there. How has the combination of photography and travel shaped the way you see the world? They’ve both taught me a great deal about empathy and vulnerability. I genuinely am a better person for it. Photography and travel share so many similarities in terms of what they require as a baseline — things like understanding where and how you might fit in a place, the ability to convey openness, having an exorbitant amount of patience. (Balkan border crossings, I’m looking at you.) In both cases, language is not a necessity. The moment passes and you capture it or you don’t. But you communicate in your attempt at understanding. You pay attention. And I think that’s beautiful.